Sven Martin gets candid with Loic Bruni, Miranda Miller, Myriam Nicole, as well as Mick and Tracey Hannah, in this Vital audio special from World Champs. The 2017 UCI Mountain Bike DH World Championships are in the books with Loic Bruni and Miranda Miller earning the rainbow stripes in Cairns, Australia. Vital's main man on the ground, Sven Martin, speaks with the winners, their mechanics and also Myriam Nicole and Mick and Tracey Hannah in this special for our podcast channel. Stay tuned for the race day slideshow and the return of The Inside Line podcast this week. Anyone else having issues loading the interview? It was working at home but I decided to delay and listen to it from work, but the entire player won't load. Onto the slideshow for now! 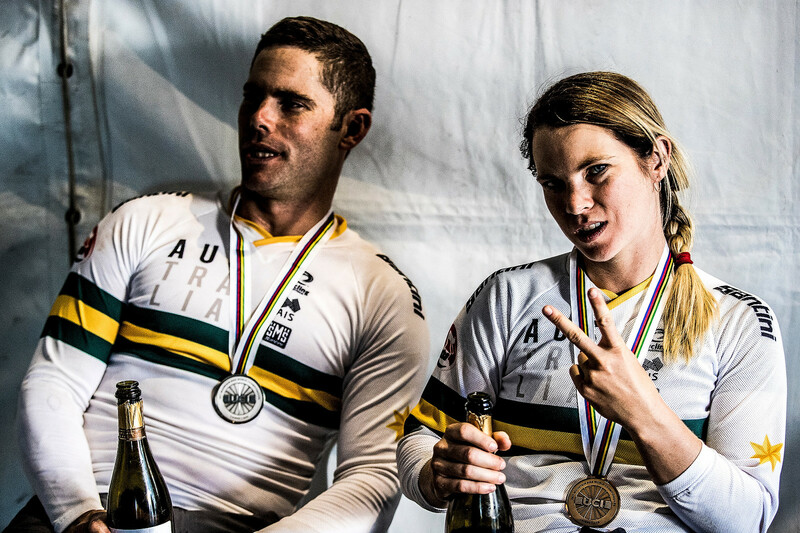 The post-race photo of the Hannah siblings is one of the great downhill race pics of all time. It will get better with age, like Lemond after the '85 Paris Roubaix. Also respect to Tracey, that was a really hard crash (as she confirmed, she hit her head)... not really fair of Warner/Claudio to be questioning why she didn't instantly jump to her feet and get back on the bike. It wasn't a simple slide out like Sam Hill in 2008, she went down hard. Awesome race content guys. Thanks for everything in the 2017 season, you really stepped it up and are providing more depth than the other mtb websites. Please keep publishing content like this. Give the Silverback whatever he asks for. I think these audios are almost more important than the photos in a way. It's a wonderful added bit of context, from which both fans and riders alike can benefit.